Thanks to the work of Michael Klenk and his students at the Institute for Software in Switzerland, the Groovy-Eclipse plugin now has cross-language refactoring support for renaming. Its use is seamless. Let me give you an example. As you can see, extract method an inline method are two other refactorings supported in Groovy code. Please send any questions or problems to the mailing list. We're happy to help. Enjoy! Andy Clement has just added pointcut match timing information to AspectJ. A number of people have been asking to have this included in AJDT, and so I did a little work and made it available in the latest dev builds of AJDT for 3.4 and 3.5. Enjoy! Questions can be sent to the AJDT developer's mailing list. In this post, I am going to describe how the inferencing engine is currently used in Groovy-Eclipse and then I will dive a deep and describe how it is implemented. I'll end the post by describing our plans for immediate the future. Code is re-analyzed after every keystroke (well, actually, it is after every keystroke that is followed by 500ms of no keystrokes). The type of every reference in the file is looked up using the inferencing engine. Every reference that cannot be found is considered to be unknown and will be underlined. Of course, Groovy being a dynamic language, not all references can be statically linked to a type (other than Object). This is especially the case when working with DSLs (such as Grails) that use metaprogramming to add new methods and fields to existing types. Later, I'll describe our plans for extensibility. Furthermore, the spread operator and the use of default parameters makes the Java way of determining which method or field is referenced impossible. So, Groovy search is significantly more liberal than Java search in what it considers a search match. If a reference corresponds to any field, method, or property in the declaring type (regardless of parameter count and whether it is accessed as a field or method), then the match is considered successful. This leads to the following scenarios. And, notice that references attached to the wrong type are not considered a match. Most of the internals of Groovy-Eclipse has been rewritten since the previous 1.5.7 release. The most recent rewrite is of content assist. Although the previous version worked (usually), there was always a noticeable lag while waiting for the content assist window to appear. This previous implementation of content assist used a combination of Java classloading and Groovy AST matching in order to find all completion proposals available at a given location, which was both messy and slow. Now, we have hooked into the inferencing engine and have completely rewritten proposal generation with extensibility in mind. And we have made some remarkable improvements in performance. That's right...there is a 3 orders of magnitude speed up under the new implementation, making content assist a much more pleasant feature to use. But please note that this is just the time for calculation of the proposals and it does not include the time required to actually pop up the window. Although Groovy-Eclipse M1 used type inferencing for code select, it was using the inferencing from content assist and was subject to the same mistakes, duplicate answers, and slowness that content assist had. The inferencing engine has unified the implementation of several of Groovy-Eclipse's most widely used features. With this unification, we have been able to significantly reduce the amount of duplicated code, improve performance, and plan for extensibility. The Abstract Syntax Tree (or AST): this is an abstract representation of the syntax of a groovy file expressed hierarchically. The code to work on can be obtained either from the disk, or it can be the latest in memory. The AST is generated by the Groovy compiler based on the current state of the editor whenever Eclipse is otherwise idle. 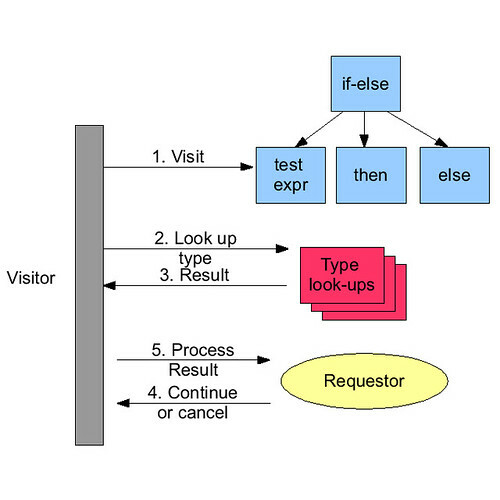 The type inferencing visitor: this visitor walks the AST (i.e., uses a visitor pattern to visit every AST node) and delegates to the type lookups and the requestor described below. A new visitor is created for each call to the inferencing engine. The type lookups: these objects lookup the type information of a particular expression using whatever mechanism they require. They can store and retrieve information about types in a way that all other lookups can use. In this way, each lookup can do what it can and coordinate with other lookups where required. Several default lookups are provided including a simple lookup, an inferencing lookup (that stores information about types via assignment expressions), and a category lookup (that looks up types in Groovy categories). Type lookups are created from a registry on each call to the inferencing engine. The requestor: this is the object that collects the type information determined by the lookups. The requestor is general and can be used as a way to store the types of all expressions, lookup the type of a particular expression, or look for expressions with unknown types (just to name a few uses). The requestor is created by client code and past to the visitor to start the inferencing process. The visitor sends this expression to the type lookups. The requestor processes the result and may choose to end the visit or continue. One of the core design goals of the inferencing engine is extensibility. The inferencing engine must be extensible in two ways. First, it must be usable to help support new features such as quick fixes and refactoring. Also, DSLs, (most notably Grails) must be able to extend inferencing with their own type lookups. It should be apparent through the description of the variety of ways that the engine is currently used that it versatile and can become the core implementation of any number of new Groovy-Eclipse features. As for DSL extensibility, that has not yet been implemented, but the stubs are available. Other DSLs will need to implement their own type lookup, but there is currently no way for these new lookups to be plugged in. Fortunately, it will be possible to use Eclipse's plugin architecture here and this will be the subject of my next blog post (after it gets implemented). We have just released AJDT 2.0.0 for Eclipse 3.5 and 3.4. In addition to a new Push In refactoring and ITD-aware navigation and Javadocs, you can find out about what's included in this release at our New & Noteworthy page. AJDT 2.0.0 will also be available in the upcoming SpringSource Tool Suite 2.1.0. This release would not have been possible with out help from the AspectJ and AJDT community. So, thank you for your bug reports, patches, discussions and being warm and welcoming to newcomers. Today, I decided to run EclEmma on the Groovy-Eclipse plugin test suite. Shockingly, I found that JUnit support, content assist, and code navigation are completely test-fress. So, I took a stab at creating a solid and flexible test infrastructure that makes it easy to write plugin tests, especially ones that exercise the Java model. I have written many tests for JUnit support (or is that GUnit? ), and some for code selection. I still need to work on content assist. So, I can now be confident that as we make changes towards the 2.0 release, we are not sliding back in functionality. There is a lot of good work that has already been put into the plugin (including groovy-aware type inference for content assist) and we need to make sure that this does not regress as we go forward. To shamelessly self promote, I wanted to mention my EclispeCon talk entitled Aspects Everywhere: Using Equinox Aspects to Provide Language Developers with Deep Eclipse Integration. It is about how we (the AJDT team) have used AspectJ and Equinox Aspects to overcome the limitations of JDT and make it more extensible to third parties. No knowledge of AspectJ is required for this talk. And if you are interested in anything Spring or AspectJ, please join us for our Bof: Spring on Eclipse: AspectJ, STS, and SpringIDE. There are so many excellent talks that it is difficult to choose what to go to. It is going to be a great conference. Currently, AJDT 1.7 is largely the same as AJDT 1.6, with the exception of the changes required so that it will run on Eclispe 3.5. The two versions will continue to be developed in unison until well after the final release of AJDT 1.7, which will coincide with the Galileo release. Please report any issues you have here or on bugzilla. Enjoy! In my previous post, I described how we have been able to use AspectJ to make JDT more friendly to other Java-like languages such as AspectJ itself and Scala. In this post, I am going to go into a little more detail as to how this happens. This post will be brief because there's really not much more to it. (If you are unsure about what AspectJ and aspect-oriented programming are, there are plenty of places to learn about it. For an excellent long introduction to AspectJ and aspect-oriented programming, see Ramnivas's I want my AOP, and for an excellent two paragraph introduction to AspectJ see Adrian Colyer's AOP without the buzzwords). We've implemented the Eclipse weaving service on top of Equinox Aspects (EA). Eclipse is highly dynamic and uses different classloaders for each plugin/bundle. For this reason, regular compile-time and load-time weaving will not work. We need something that can hook into the Equinox OSGi framework and perform weaving as bundles are loaded into the framework. This is exactly how EA works: EA provides a weaving hook that inspects each bundle as it is being loaded to determine if it requires any weaving. If the bundle does, it is sent off to the AspectJ load-time weaver. Actually, it is a little more fine-grained than this since classes are only sent to the weaver as they are loaded. The benefit of using EA is that it helps us stay robust through different Eclipse versions because we are not shipping woven code or feature patches. Currently, the Eclipse weaving service is available for Eclipse 3.4, 3.4.1, 3.4.2, and (soon to be released) 3.5M5. AspectJ is a language that is very close to Java, but it isn't Java. One might expect that since AspectJ is an extension of Java, Eclipse tooling for AspectJ would just be an extension of the Java Development Tools. But it's not that easy. This post describes the problems that we have faced when integrating AspectJ tooling into Eclipse, and motivates a solution that I will elaborate on in future posts. JDT has not been engineered to be extensible, and rightly so. It is a set of tools that are finely tuned towards making the Java development experience as smooth and convenient as possible. Focusing on extensibility would be to the detriment of the JDT users who program in Java only. However, this makes life difficult for us tool developers. Users expect high quality tooling for Java-like languages (i.e., languages that run on the JVM) because that is the bar set by JDT. Furthermore, they want tooling that integrates seamlessly with Java tooling. But, JDT won't do that! So, how can we provide good programmer experience in AJDT? We want to make editing AspectJ look and feel as much like editing Java where it makes sense, and at the same time provide additional functionality so that the user is aware of AspectJ-specific issues. 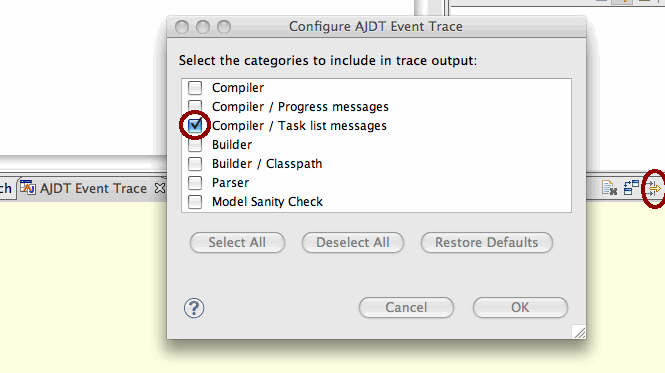 Up until AJDT 1.6.2, there have been limited options to integrate with JDT. One example of successful integration is the AspectJEditor, which behaves mostly like JDT's CompilationUnitEditor, providing eager error detection, syntax highlighting, content assist, some refactoring support, etc. The AspectJEditor should be a subclass of the CompilationUnitEditor, But the CompilationUnitEditor is not public API and AJDT really shouldn't be touching it. Or, at least, the responsibility is on us to maintain compatibility in future versions. In addition to using private APIs, the AspectJEditor uses some reflection to access private fields of its super class and copies some code, where reflection isn't practical. Through this combination of techniques, we have been able to largely implement JDT's behavior in AJDT. But, there is some functionality that we want AJDT to provide, but is not possible using private APIs, reflection, or code copying. Let's take a look at the Open Type Dialog. We would really like to see our aspect types in the standard Java Open Type Dialog. But this is unfortunately not possible. There is no API (public or private) that we can use to do this. Even the use of reflection or code copying will not help. What we really need is to gain access to JDT's Java indexer and somehow convince it to index aspect files. This is a big problem, and one that we have run into many times during our development of AJDT. JDT is not engineered to be compatible with Java-like languages. But, tools for languages such as Groovy, Scala, and JRuby are gaining in popularity and require the same kind of JDT integration that is just not available. There is a long standing JDT bug to address this, but it does not seem like it will be fixed any time soon. However, there is a solution! Since AJDT 1.6.2, we have been able to provide deep integration with JDT by using AspectJ on JDT itself. We are using Equinox Aspects to weave into the platform and expose functionality in a structured way through the use of Eclipse extension points. In future posts, I will describe how we have designed our JDT weaving service to expose otherwise inaccessible functionality in JDT and how this weaving service is generic enough to be used by tool developers for other languages. You can also hear more about this at my EclipseCon talk: Aspects Everywhere: Using Equinox Aspects to Provide Language Developers with Deep Eclipse Integration. I wanted to introduce my new blog, where I will be talking about the AJDT and AspectJ projects, aspect-oriented programming, OSGi, and all the nifty tools we are making so that these technologies can work better together.